Derry recorded their first league win at the Sligo Showgrounds since 2009 on Saturday night thanks to goals from Rory Patterson and Ronan Hale. 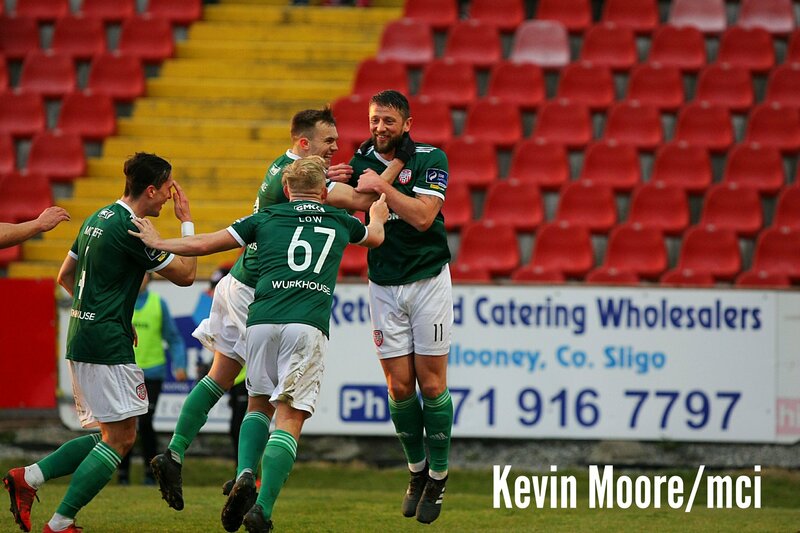 McEneff was fouled outside Rovers’ box and Patterson’s following deflected free-kick flew into the back of the net having wrong-footed the opposition goalkeeper, Micheál Schlingermann. At the hour mark Sligo made all three of their substituions in an effort to shake Derry’s dominance but it was Schlingermann next in action who tipped an angled Curtis chance over the bar. With sixteen minutes to go, Ronan Hale drilled a low hard shot to the bottom left corner and the ball slipped underneath the goalkeeper’s dive and doubled Derry’s lead. As Sligo continued to try and get back into the game it was an ex player of theirs that kept them at bay as Gavin Peers rounded out his commanding performance and his Derry City debut with a clean sheet. Another Candystripe debut was marked on the night as John Cofie made a late appearance from the bench in place of Rory Patterson. The result marks Derry’s fifth win in a row and moves them up to fifth in the league, a point behind Shamrock Rovers who have played two games more than City.